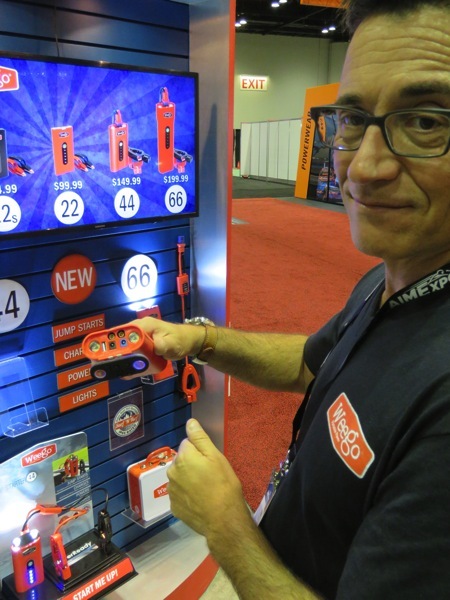 WeeGo CEO Gerard Toscani thinks everyone should have emergency power handy. Don’t wish you had. My first question to WeeGo CEO Gerard Toscani, left, was about the name. His answer, simply enough, was that the product, one of any number of lithium battery emergency power sources, was small, and it would get you going a lot faster than rubbing two sticks together and praying for fire. Their feature-laden lineup of ergonomically pleasing hi-vis orange charging and emergency starting power begins with a candy bar sized phone/watch/fitness tracker charger and tops out with their top-of-the-line WeeGo 66. The latter packs a huge amount of amperage in a very compact package, capable of starting a 747 that’s stalled on the runway or lighting a stadium in case of a blackout. Well, maybe not so much. But the new for 2017 portable power pack delivers up to 600 cranking amps, enough for gas engines up to 10L, and diesels up to 5L. Remember, this is something you can hold in one hand. But without the right technology, cranking power alone only gets you so far. Just ask Samsung. What else? USB charging for all your portable power hogs, plus 12V and 19V outputs to power accessories and laptops. And even though you say you’ll never need one, they claim their 600 lumen dual LED flashlight will operate in strobe mode for 18 hours, and can signal an SOS for up to 36 hours. Capable of starting a 747 that’s stalled on the runway or lighting a stadium in case of a blackout. 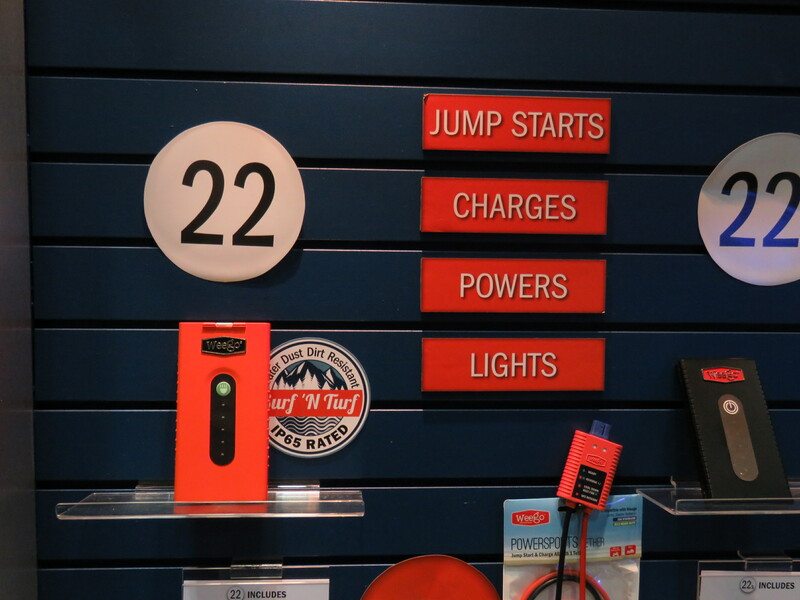 Pack recharge is fast, and claimed standby power is up to 3-years. Built-in protection against power surge, overheating, polarity screwups, and even an anti-spark feature in case you’re operating in an inflammable environment. WeeGo power packs come in a range of sizes and capacities. The 22, shown, is well suited for powersports, including offroad and on the water. There’s not a lot of price spread between the emergency starter models. The middle of the road 44 retails for $149, the 22 (recommended for powersports, can start a V-8 if needed) a little less. All come packed in a signature orange housing that packs easily and is impervious to most of the environmental challenges of riding, boating, and off-roading. Note: the optional Powersports Tether accessory is a nifty solution for hooking up hidden batteries that are hard to access in the garage, and impossible when stuck by the side of the road in the middle of the night. This modest add-on works for both charging and starting, and would have saved my back on more than one occasion in the days of having to kick-start a dead-as-a-doornail Shovelhead. Today, when kick starters on street bikes are only found in museums, emergency battery power should be considered an essential. All WeeGo products are warranteed for 18 months. These are good products from a talented, progressive American company. This entry was posted in marketplace news, powersports and tagged battery, emergency, portable power, starting on December 5, 2016 by John Siebenthaler.